Living within one’s means is the bedrock of financial stability. But for consumers still facing the lingering effects of years of frenzied borrowing and spending that preceded the recession, the sage counsel of our 30th president remains a lofty aspiration — and one out of many people’s grasp. Financial difficulties rose last month for middle-income households, according to the Consumer Reports Index, an overall measure of Americans' personal financial health. The Trouble Tracker, a measure of financial difficulties, climbed to 37.5 from 32.7 for middle-income Americans. The areas that saw the greatest increase were missed payments on a major bill (other than mortgage) and the inability to afford medical bills or medications. 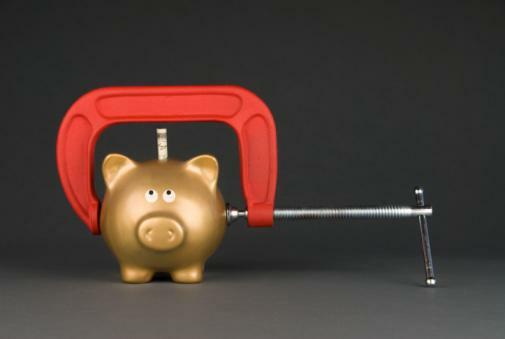 Whether the trouble stems from the increase in the Social Security payroll tax that hit paychecks in January or a holiday spending hangover, it doesn’t bode well for consumers trying to get their finances under control in 2013. So how do you know if you’re living above your means — in other words, spending more than you’re bringing in? Not being able to cover the bare necessities is an obvious red flag. But there are some other tell-tale signs you’re in over your head. 1. You couldn’t survive financially without your job’s income for at least six months. This is the universally touted emergency fund financial advisors love to talk about. In its 2012 annual financial literacy report, the National Foundation for Credit Counseling (NFCC) found that two out of every five adults (40%) said they were saving less than the prior year, and 39% didn’t have any nonretirement savings. Whether you call it a rainy day fund, emergency fund or cash reserve fund, it needs to be established and replenished over time, says Sheryl Garrett, founder of Garrett Planning Network, a group of fee-only financial planners. And she knows it’s boring: “I’ve met very few people who enjoy saving money in their cash reserve account. It’s not interesting, fascinating, or complicated. Yet, it’s one of the most critical and fundamental concepts in personal finance,” says Garrett. Generally, cash reserve need is based on how long you expect to be unemployed if you lose your job. Three months of expenses is reasonable, six months is ideal – particularly for self-employed people and those with volatile incomes, Garrett says. But it could also come in handy for other emergencies like a major medical expense or expensive home repair. How much do you need to meet your ongoing monthly living expenses, including mortgage, food, insurance, car maintenance, utilities, etc. -- should you lose your job or need to pay a major medical expense? That’s how much you should set aside. “Bottom line, based on your skills (presuming the individual is not already retired) how long would it take in this market to find another position with similar income,” Garrett says. 2. You’re saving less than 10% of your pay. Financial advisers differ on the ideal savings rate, this is a general guideline. “If you haven’t been saving at least 10% of your income for retirement since age 25, you’re not saving enough,” Garrett says. And if you’re over 35, you should tuck away more than that. To put this in some context, a 2011 paper published by the Center for Retirement Research at Boston College, “How Much to Save for a Secure Retirement,” tried to calculate the savings rates required to maintain pre-retirement living standards. The authors found that, assuming a 4% withdrawal rate during retirement, someone who starts saving at 25 and retires at 70 needs to save 7% of earnings to achieve an 80% replacement rate at retirement. But if you’re planning to retire at 65, you’d need to save 15% of your income. 3. Your mortgage payment is more than one week’s salary. This one answers, in part, the all-important question, how much home can you afford? The one-week salary figure is a rough guide and “means that your mortgage payment would not be more than one-quarter of your income,” says Harold Evensky, certified financial planner and president of Evensky & Katz Wealth Management in Coral Gables, Fla.
Another way to think about this one is you’re probably living above your means if more than 35% of your income (a more-forgiving number) goes to into your home (rent, maintenance, upkeep, mortgage), says Rick Kahler, a CFP in South Dakota. “It’s a general rule of thumb; some lenders may say 30% and others 40%,” he says. 4. Your credit card balance has remained the same for the past year. 5. You buy big-ticket items through interest-free, deferred-payment offers because you think you’ll be able to afford it next year. Whether these deals are of the "Buy now and pay no interest until next year" or "No monthly payments for six months" variety for a furniture set or new washer and dryer, they sound enticing but can be deadly. These retailer deals involve no monthly payments for a certain period of time (usually a year) or no interest on payments made during the promotional period. But if you fail to pay for your item in full by the set deadline, you’ll get hit with sky-high interest charges. And it’s common for interest to be charged to your account from the date of purchase. If you can’t afford to buy it now, will you be able to later? 6. You use one credit card to pay another credit card’s balance. Another symptom of living above your means: You’re always looking for new cards to transfer the balance to “but never seem to get ahead,” says Erin Baehr, a CFP in Stroudsburg, Pa. If you’ve racked up debt on a high-interest card, moving the balance to one with a lower interest rate will save you money in the long run. But if you’re doing a balance transfer because you need to raise your personal debt ceiling, that’s not good, says Scott Bilker, founder of DebtSmart.com and author of "Talk Your Way Out of Credit Card Debt." 7. You pay an overdraft fee on your checking account every three to four months or more. Overdraft fees — or “non-sufficient funds fee” in bank-speak — are charged when there's not enough money in your account to cover a check or debit card payment. And consumers might not even know they could get hit: A May 2012 survey of consumers commissioned by Pew’s Safe Checking in the Electronic Age Project found that nearly one-fifth (18%) of consumers incurred an overdraft penalty fee in the previous year, and more than one-third of survey respondents weren’t aware their bank offered overdraft coverage until they incurred a penalty, which range from $30 to $35. “One-off overdraft situations aren’t necessarily an indicator [of living beyond your means]. It’s the ongoing, repetitive nature of overdraft fees that will signal a problem,” says Mary Beth Storjohann, CFP with wealth adviser Hoyle Cohen in San Diego. "I know things are tight, but I need to take that vacation, it's for my mental health," or “I work so hard, I deserve that new flat-screen TV.” Sound familiar? “That's really rationalizing what you know is not a good idea for you… Like a spa day or expensive dinners out. I don't often hear that from people who are comfortable financially, but more so from those who are struggling,” Baehr says. Readers, what are some other indications you're living above your means? Can Value Investors Consider CommScope Holding (COMM) Stock? Do Institutions Own Anworth Mortgage Asset Corporation (NYSE:ANH) Shares?